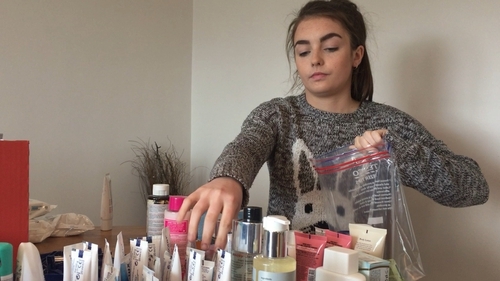 A 17-year-old from Greystones, Co Wicklow is to donate more than 400 grooming kits for families of sick children attending Our Lady's Children's Hospital, Crumlin. As a child, Rachel Casey had leukaemia, and spent a lot of time in and out of the hospital. She has been collecting unwanted Christmas gifts, as well as donations from local businesses since December to make the kits. Among the items in the grooming kits are shampoo, body wash, toothbrushes, toothpaste and deodorant. "I wanted to give back to a hospital that has been so kind to me. So many people helped me when I was sick. So I wanted to do the same thing and help other people in my situation," she said. "I’m just trying to make life a bit easier for parents when their child is sick in hospital because it's one less worry to worry about." Rachel received other donations, such as toys, pyjamas and stationery. She also raised almost €2,000 with her friends by bag-packing, and this is being used to buy items for the grooming kits. "We've received such a large scale of items, and it's really just unbelievable how generous people are," she said. "This project means so much to me, and when people support you during it, it really helps, and it encourages you to do as much as you can for them." Rachel will start delivering the kits and other items tomorrow to both the hospital and the Ronald McDonald House. Director of Nursing at Crumlin, Rachel Kenna, said: "We are so grateful to Rachel Casey and her family for their extremely kind donation of parent and patient toiletry packs to the hospital. "The complimentary packs will be given out to all families and patients on the wards at Crumlin and our parents' accommodation units who find themselves in an emergency situation on bringing their child to hospital. "The kindness shown by Rachel is an example of how our patients at Crumlin like to help other patients and families, and support staff in continuing to look after all patient’s needs."